But, we had so much fun! And we laughed! And we goofed around! And we laughed some more! National Underwear Day is held on August 5, 2011. But, today is Dav (pronounced Dave) Pilkey's birthday who is the author of the Captain Underpants Series. 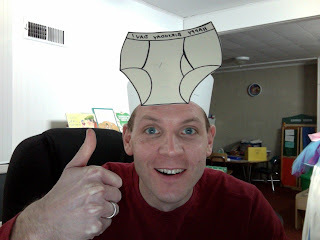 So, let's greet our kids or students today with a little undergarment humor and proclaim today "Happy Underwear Day!" It is silliness that sets Pilkey apart from every other author. From his silly nickname, Dav, that stuck after a mistake on his Pizza Hut name tag (pilkey.com) to the inclusion of his pets into books like Dogzilla and Kat Kong. He is always infusing humor into his books. This is an author who loves to have fun and thrives at being silly for a living. Dav Pilkey has publicized that it was his struggles in school that ultimately led him to the successful career that he has today. Back in elementary school, he was a boy that often got in trouble and nowadays would have been labeled as a child with an attention deficit. The punishment for his shenanigans in classroom was to be sent to the hallway. It was in the hallway where his career began. Captain Underpants was actually invented in second grade during those long stints at his hallway desk. The fact is that Dav Pilkey didn't mind going in the hallway because he always stocked the desk with lots of supplies and his friends all loved the comics he brought back to the classroom. His teacher often tried to humiliate him into correcting his behavior by tearing up his books and telling him he can't make silly books for the rest of his life. Things at school really don't change for Dav until college when a professor at Kent State University encouraged him to write. It wasn't too long after that encouragement that Dav won a writing contest and got his first book published, World War Won at the age of 19. Honestly, it is best that you hear him tell the story of his experiences with teachers by viewing a speech from the International Reading Association Conference. It is a hoot! Note: Links and videos updated February 24, 2011. You know we are just huge Dav Pilkey fans. No need to feel guilty, I once leveled books for our classroom teacher & Capt. Underpants (poop aside) actually has great vocab level! Thanks also for cluing me in on Ricky Ricotta & the Paperboy- our kiddos would love them. What a lot of joy this author brings. Great post. We LOVE Dav Pilkey and All the Adventures of Captain Underpants. I think that any book that gets your kids excited about reading has great educational value. It is up to us as parent to teach our children that just because something is written in a book does not mean it is ok for us to use in "real" life. It was because of Captain Underpants that my 6 year old submitted something to the Young Authors competition this year! I will enter into any debate in support Dav Pilkey's books. I totally with your statement - "I think that any book that gets your kids excited about reading has great educational value. It is up to us as parent to teach our children that just because something is written in a book does not mean it is ok for us to use in 'real' life"! Congrats to your 6 year old for entering a writing contest. That is very brave!